My new cookbook, Love & Lemons Every Day, is out now! Here are some of my favorite recipes from the book, ones that I love making again and again. The new cookbook is out! If you’ve received it (thank you! ), I sincerely hope you love it! First things first, I wanted to remind you that it’s still not too late to get the free downloadable Bonus Recipe Bundle! If you ordered the book in the past few days or if you’re planning to pick it up today, be sure to claim that gift! Click here for details. And now for my favorite recipes! I have to tell you that I had a difficult time narrowing this list down. One requirement to creating a cookbook is that you have to love ALL of the recipes because you’re going to eat them over and over and over again while you test them. So, anything that I loved once but didn’t want to eat again and again and again… well it simply got booted from the book :). Even though the book is finally out, these seventeen recipes are regulars in our every day cooking rotation. I hope you love them and I’m so excited to see what your favorite recipes are! Tomato & basil is one of my favorite pairings, so I had to find a way to eat them for breakfast! 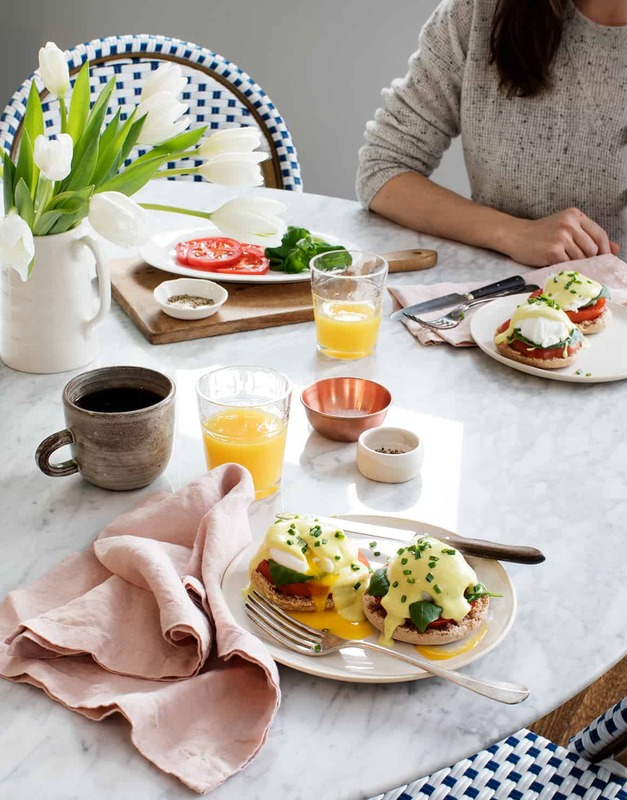 This caprese salad-inspired eggs Benedict was my solution, where poached eggs take the place of the traditional mozzarella. The creamy homemade hollandaise is vegan, so if you sub in baked tofu for the egg, you’ll have a totally vegan breakfast that’s just as delicious as the egg version. Waffles are one of my favorite weekend breakfasts, and these crisp, nutritious buckwheat waffles are totally vegan & gluten-free! I love to load them up with seasonal fruit, a dollop of yogurt, and plenty of maple syrup for a real weekend treat. There is truly nothing I love more than a ripe summer peach, and this salad will be the first thing I make once peach season (finally) rolls around. It has a wonderful jumble of crisp & juicy textures, sweet & tangy flavors, and a fresh, surprising note from the dill. Even better, this salad keeps well, so I like to make it ahead and enjoy it for as many days as I can make it last (usually not long)! I love enjoying thick, charred heads of grilled romaine, but if you don’t have a grill, don’t worry. The creamy, tangy vegan Caesar dressing is the real star here, and this salad is just as good when it’s tossed together in a bowl. Confession: I first tested this salad in the winter, using sad out-of-season tomatoes. It’s a testament to how good this recipe’s seasonings are that it still held up. Layers of marinated veggies, creamy lemon yogurt, toasted pita croutons, roasted chickpeas, and fresh mint combine to create a salad that’s a feast of textures and flavors. Oh, and of course, make it in the summer with peak-season tomatoes to have it at its best. This is not your average potato salad. Not only is it loaded with crisp fresh veggies and greens, but its smoky, tangy chimichurri dressing makes it irresistible. It’s a great one to pack for picnics, potlucks, or a weekday lunch. My take on Thai tom kha, this easy soup is one to try before the weather warms up. Lemongrass, ginger, and cilantro give the coconut broth a fresh flavor that feels bright and spring-y, and the soup is packed with hearty veggies, like sweet potatoes, kale, and mushrooms, that you can easily find at this time of year. This creamy vegan chili is my homage to the tart tomatillo. Roasted and blended, they create this chili’s bright green base, giving it a fantastic tangy flavor. Pepitas add extra creaminess, poblano peppers add a little heat, and corn & zucchini finish it off with some necessary crunch. If peaches are my all-time favorite summer produce, then sweet corn is a close second. 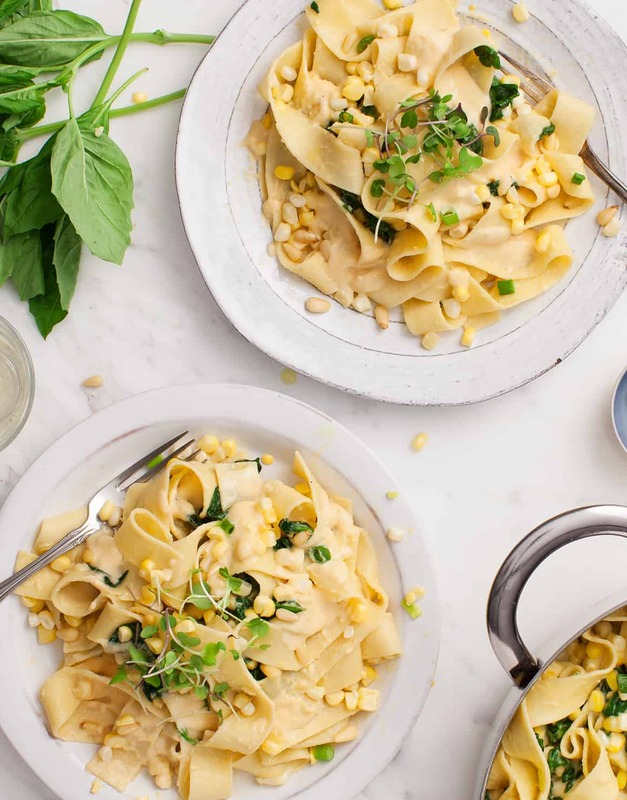 In this pasta, starchy corn kernels blend with cashews, lemon, and smoked paprika to make a light, smoky, and creamy sauce. More fresh corn adds a crisp textural contrast to this heavenly summer dish. A vegan potpie has been on my list to make at Thanksgiving for years. You can even read about my plans to make one in this Vegan Butternut Squash Stuffed Shells post from 2015. Still good, but not potpie. This recipe, though, has been worth the wait. The flaky whole wheat crust is delicious, but the savory mushroom white bean filling really shines. In fact, I like the filling so much that I’ll often make it without the crust and enjoy it as a stew! Waste not, want not, right? In this recipe, a whole head of cauliflower becomes a vegetarian entree that doesn’t disappoint. Thick, meaty cauliflower steaks get caramelized in the oven, while the remaining florets are blended into a luscious vegan lemon-miso sauce! Preserved lemon salsa verde adds a little crunch and a bright pop to finish it all off. Years ago, my first falafel wrap showed me how fantastic vegetarian cooking could be. With this recipe, I aim to pass that experience on to all of you. These falafel, made with red lentils instead of chickpeas, are full of herbs and spices, and they are easy to make! They’re light and healthy, but they certainly prove that vegetarian meals can be fun, satisfying, and full of flavor. This. Sauce. When you try it, you won’t believe it has only five ingredients. It’s delectable – bright & tangy with smoky undertones. In fact, I added this recipe to the book just to show it off! These bowls, with sautéed swiss chard, crispy roasted potatoes, hearty brown rice, and totally addictive spicy pepitas, have become a staple in our kitchen. I hope they will in yours as well. In all honesty, Jack should be writing about this recipe, because it may be his favorite sandwich of all time (to be honest, it may be mine too). This is not your ordinary portobello sandwich! Together, grilled portobello strips, a savory homemade horseradish sauce, and bright marinated cabbage combine to form a vegetarian reuben that will make you forget reubens were ever made with meat to begin with. If you’re someone who loves Moroccan flavors, then this comforting cinnamon-spiced tagine is for you. Parsnips, sweet potatoes, and dried apricots give it a light sweetness, which is especially good balanced with a scoop of the spicy Homemade Harissa on page 281 of the book. Nutty, chocolatey, and salty/sweet, these cookies are to-die-for good. They’re soft in the middle, crispy on the edges, vegan, and gluten-free. It took me a few tries to get the baking time in the recipe just right, but no one complained each time I made another batch. In fact, even now that the recipe’s perfected, there’s a good chance you’d find me baking them on any given Saturday. I couldn’t let myself write another cookbook without including a lemon cake recipe, and this pistachio-olive oil version is a real winner. It’s perfectly moist, vibrantly lemony, lightly sweet, and meant for celebrations (although I keep slices in my freezer for little personal every day “celebrations”). The lemon glaze adds an extra note of bright citrus flavor, so be sure not to skip it. I just received my book yesterday and can’t wait to try out some of these recipes! Especially the peach salad with dill! I have a question: for the lasagna roll-ups would they still turn out basically the same if I used real ricotta. Also, does the vegan ricotta have the same texture as ricotta? One more: what would a substitute for coconut oil be? Thanks! I am sooooo excited to devour this cookbook! Hi Olivia, it would probably work with regular ricotta (seasoned up a bit with lemon zest, garlic, salt, pepper, and herbs… although I think you will love the vegan ricotta – once it’s baked you won’t know the difference – it’s decadent and delicious! I don’t think there’s coconut oil in the lasagna recipe – let me know what recipe you’re referring to? thanks! I hope you love the book! Is there any substitutes for the coconut oil in the sweet potato biscuits (or any of the recipes where the oil is not melted)? Butter would be the only sub. I hope that helps! I have already made three recipes. The first was the pasta with the fresh zucchini and a carbonara sauce. That was amazing and a total revelation. Tonight I made the veggie stock, which took a bit longer than the recipe said, but tasted as complex as a good bone broth. And then I also made the vegan artichoke and potato chowder. That was delicious as well! Tonight I made the Sweet Potato Chocolate Cake and it was amazing! The chocolate flavor was amazing 👌 The frosting had a sweet potato hint and so chocolatey! The cake was so light. I could eat the whole cake! My family was surprised there was no animal product. Hi Olivia, I’m so glad you loved the cake!! Hi, Jeanine! I love your cookbooks and can’t wait to start cooking out of the new one! One question for you– do you know of any suitable alternatives to cashews, especially in recipes like the butternut mac that soak + blend them into a cream? I’m allergic to both cashews and dairy and at a loss on what else might work in these instances. Are there other nuts that will blend into a sauce well? White beans, maybe? Would love to hear your insights 🙂 Thanks! Hmm, white beans might work, actually. I haven’t tried it so I can’t say for sure, but I think that would be a nice, creamy alternative. I might add a little more olive oil to compensate for the difference in fat content. Hi Jeanine! I just made the Almond Buckwheat Waffles and I cannot figure out what I did wrong. When the waffles were done cooking they were crispy on the outside but squishy and sorta raw on the inside. Anyway, they tasted AMAZING and I still devoured them. Any ideas on what I could have done? Thanks! Hi Liv, I’m glad you liked them! It sounds like they just need to cook longer – I think I wrote in there that I cook mine a minute or two longer than normal waffles. Depending on your waffle maker, you might try a little longer. I find that it really takes a lot for the almond/buckwheat mixture to cook through. Hope that helps! wow, these recipes look incredible. The sweet corn pappardelle looks so bright and tasty. This book is my #1 have-to-buy cookbook :). Is there any bookstores I can pick it up from in Australia? I can’t wait to grab a copy. Hi Sarah, thank you! It’s not currently in stores in Australia, but it ships worldwide from http://www.bookdepository.com. I hope you enjoy it!